AMD’s Q1 earnings are in, capping off a very important quarter for the company. For the first quarter of the year, AMD booked $984 million in revenue, a sizable 18% jump over Q1 last year. This revenue increase was enough to narrow the company’s losses, but not to wipe them out entirely. On a GAAP basis the company lost $73M for the quarter, leading to an overall loss of $0.08 per share. Q1 is also a relatively weak quarter for technology companies in general, and AMD is no exception, with revenue down and losses up slightly compared to their revenue-strong fourth quarter of 2016. March of course saw the launch of their first CPUs based on the Zen architecture, kicking off AMD’s big comeback into the CPU space that has long been their core competency and biggest breadwinner. The Ryzen 7 launch in turn isn’t meant to turn AMD’s fortunes around overnight – especially when it was only on retail shelves for one month of the quarter – but it’s the start of something bigger for AMD. The impending launch of Naples – which AMD has reiterated is on track for this quarter – will be the second part of this turnaround. One bit of good news here is that AMD’s gross margin is up, and is now at 34%. AMD has structured their business to be able to operate with margins in the 30% range, but 35% has long been considered the soft floor for profitability, which means AMD is getting close to that. AMD’s cash flow is a bit less rosy though; the company has $943 in cash and short-term investments as of the end of Q1’17, versus $1.26B in the prior quarter. On an overall basis, AMD’s asset value is largely unchanged, with the difference in cash being offset by an increase in the company’s inventory and accounts receivable. 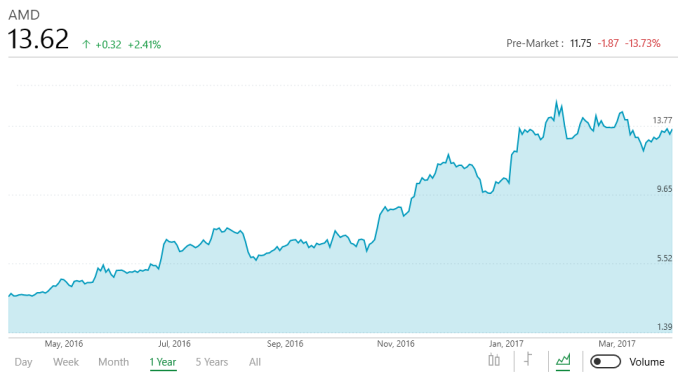 AMD’s non-GAAP results, which the company reports as a means to better show the state of the core business, show similar results. Non-GAAP results show a smaller loss overall, but the company is still in the red on operating income and net income. There is no single large factor this time around hurting GAAP results – AMD isn’t taking any large write-offs or the like – but rather it’s a number of smaller items, including the cost of employee stock-based compensation and charges related to AMD’s $1.41B in long-term debt. Breaking results down by segments, AMD’s situation in Q1’17 was fairly similar to past quarters. The Computing and Graphics segment is still the largest part of AMD’s two divisions, and outside of overall stock-based compensation, is still the division losing AMD money. Overall the Computing division booked $593M in revenue for the quarter, which is up 29% from Q1’16 and in fact is barely down from the always-strong Q4. The operating loss for the quarter was $15M, down significantly from Q1’16’s $70M loss, and even still better than Q4’16’s $21M loss. The biggest factor here, of course, is Ryzen. With its high prices compared to AMD’s past desktop processors, it has been a big part in increasing AMD’s overall average selling price both on a quarterly and yearly basis. Similarly, GPU ASPs were up as well. Meanwhile AMD’s Enterprise, Embedded, and Semi-Custom segment continued to stay in the black for the quarter, but revenue did drop from the previous quarter as holiday console sales tapered off. Revenue for the quarter was $391M, up slightly from the $372M of Q1’16, while the operating income was $9M, versus last year’s $16M. Otherwise the All Other segment booked a $23M loss due to the aforementioned stock-based compensation. Looking towards the future, AMD a 17% revenue increase for Q2, while gross margins are expected to dip slightly to 33%. Besides enjoying a full quarter of Ryzen sales, AMD has once again confirmed that they will be launching both the Naples server CPU and the Vega GPU architecture in this quarter. Both are high-end, high-profit products that should significantly help AMD’s bottom line if they perform as expected. Though even with the Q2 launch, AMD won’t enjoy the full benefits of those launches until Q3 when they have further ramped up and collect revenue for those products over the whole quarter.